You asked for it MELBOURNE! 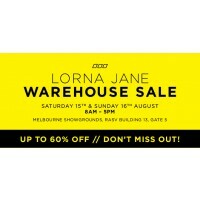 Lorna Jane is having a Warehouse Sale! Be sure to check out this one time only event. UP TO 60% OFF. NEVER DONE BEFORE. DON’T MISS OUT! 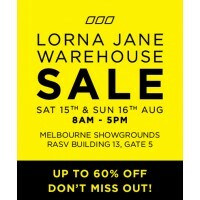 Kick start your active journey in the world’s leading activewear brand Lorna Jane, available at up to 60% OFF 2 days only. Designed for active women, by active women with an emphasis on that Fit Feeling. 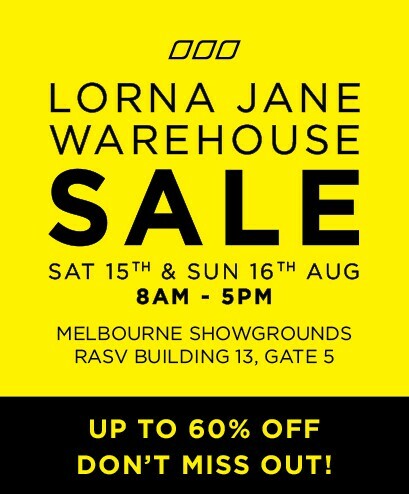 Don’t miss your chance to snap up Lorna Jane’s trademarked fabric technology LJ Excel™ for a fraction of the price. Best parking at GATE 5. Entry via Langs Road. Tram No. 57 (West Maribyrnong to Elizabeth Street, City) stops at the main entrance (Gate 1) of Melbourne Showgrounds on Epsom Road.